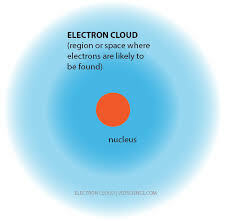 Electronic Cloud Model is an atomic model proposed by Erwin Schrödinger and Werner Heisenberg in 1926. Through this model, they wanted to explain the probable position of an electron in an atom. According to this model, electrons do not revolve around the nucleus in straight elliptical paths, as proposed by the earlier models. On the contrary, they are found in clouds at specific places near the nucleus of an atom, or even inside it. Since the traditional Bohr’s Atomic Model could not answer the increasing contradictions in quantum mechanics. So Erwin Schrödinger and Werner Heisenberg in 1926 came up with the electron cloud model. This model uses the concept of ‘orbitals’, referring to regions in the outer regions of an atom where electrons are likely to be found. When Was the Electron Cloud Model Discovered? 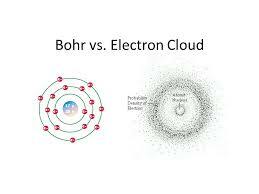 The Electronic Cloud Model was discovered by Erwin Schrödinger and Werner Heisenberg in 1926. The Electron Cloud Model was created by Erwin Schrödinger and Werner Heisenberg. What is the Charge of the Electron Cloud? Electrons are negatively charged and their overall charge balances the positive charge of the protons. The electrons have a negative (-1) charge. If there is any deficiency in the number of electrons, the atom will be ionic and will have a net charge.